There are other shorter articles, and they do a fine job of covering the basics. If that’s all you’re looking for, click on the link and consider yourself well-rewarded. But if you desire more than tidbits, read on. Rapid review! Saudi Arabia and Iran are quite angry at one another. More specifically, the elites of both Saudi Arabia and Iran have made deliberate, public choices intended to anger one another. Saudi Arabia started it by publicly executing a high profile Shi’a dissident. Iran escalated it by allowing the Saudi embassy in Tehran to be torched. Saudi Arabia and its two key allies, Bahrain and the United Arab Emirates, ratcheted it up a notch by withdrawing ambassadors and downgrading relations. For those perusing this site, the Saudi-Iran cold war is probably well-known; what perhaps isn’t is why the conflict began, and why it continues. The essential tale: there are four natural poles of power in the Middle, but three of them have been out of the running for a decades. In geopolitics, there are natural bases and there are borderlands. Natural bases are places that are geographically just secure enough to slow or even halt invasions. They also must be ecologically and geologically just rich enough to support modern economies. Depending on the era and the level of technology, the kind of ecology and geology differ. You can’t, after all, build a great power out of sand – that is, until you invent air conditioning and desalinization. These four bases are Egypt, Turkey, Iran, and Saudi Arabia. All fit the conditions that allow them to be great regional powers: just enough isolation to keep from being interfered with readily, just good enough ecologies and geologies to produce the kinds of resources needed to field great power in the modern era. The grey zones in between are the places to vie for influence and power. But three out of four have been unable to spread their influence very much. That’s primarily because they are tied by alliance to an even greater power: the United States. And the U.S. does not want a united Middle East. The U.S. does not want to see a strong Middle Eastern power dominate all the others. Really, it wants the opposite: a balanced set of powers each kept in check by alliances with the United States. This gives the U.S. huge amounts of strategic room, since any would-be great conqueror must start local before they could challenge the U.S. for worldwide hegemony. For example, imagine if the U.S. had been allied to both Czechoslovakia and Poland before World War II. 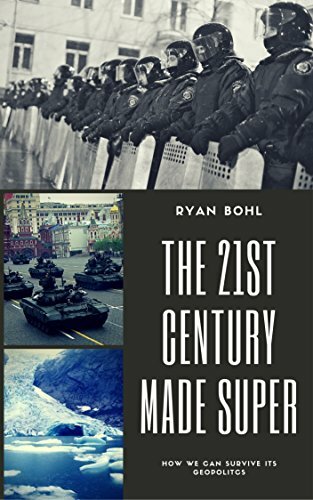 Imagine if there had been U.S. troops in both Poland and Czechoslovakia with roughly the same technological edge as Hitler’s Germany. Now imagine if they spent most of their time preparing for German invasions. Would Hitler have risked war with the U.S. so early on? Doubtful; in such a scenario, the U.S. would have seen the conquest of Austria as a grave threat. It might have even caused a U.S.-Nazi war before Germany had rearmed. This isn’t to say that U.S. hegemony is good, and that the U.S. presence in the Middle East is somehow stopping World War III. Rather, it’s the result of the strategic, selfish intent of the U.S. – keep regions divided up and looking to America to solve their problems. The net result of this is decades of Egypt, Turkey, and Saudi Arabia all being kept on relative leashes. From a geopolitical standpoint, it would make enormous sense for Egypt to interfere more in neighboring Libya to establish influence and even take territory; Libya’s underpopulated east, filled with oil, could readily be controlled by Egypt. But this would not benefit the United States (nor anyone else in the international community, for that matter); it’s therefore far too much of a risk for Cairo to take. After all, what if the U.S. decides to restore Libya as it did Kuwait from Iraq? Both Turkey and Saudi Arabia have also had the same leashes, as well: to expand too much risked drawing the ire of the United States and its many allies. But that past progressive is key, for even the superpower has limits. And those limits were all too apparent from 2003 onwards. The United States vast power allows it to take risks that could destroy others. One of those risks was trying to remake Iraq into its own image in 2003. America hoped superior firepower would make the job of pacifying Iraq easy; that overlooked human nature. Super the United States’ power might be, it is not God. It could not remake Iraqi society into a liberal democracy in just a few years. (Ironically failing to learn from the Soviet Union just how useless such short timelines are). This has made Washington much more careful in how it uses power. Therefore, more than at anytime in its recent history, the Middle East is on its own. American allies used to be able to assume that the U.S. would go to the mat for them; they absorbed this lesson after the 1991 Gulf War, where the U.S. sent half a million troops to liberate tiny Kuwait. But that’s no longer the case, and it means American allies must look to themselves to solve their security problems. This has gone hand-in-hand with final collapse of the badly-drawn states of Syria and Iraq. For much of the 20th century, these states were held together by brute force paid for by the U.S., USSR, or Britain, each of whom wanted influence. When the Cold War ended, the U.S. wasn’t able to pay the old Soviet bills; without Soviet competition, it didn’t need to, either. Meanwhile, population densities exploded; technology broke down government control, making state propaganda less and less useful; and a lack of economic aid made development slower than Middle Easterners often wanted. This exploded into the Arab Spring, which shattered Syria and Libya. Hardly any outsider did much to stem the chaos; in fact, many cheered it on. To the regimes that weathered storm, it was more obvious than ever that they, and they alone, held the keys to their survival. And this, more than anything else, is what has prompted the Saudi-Iranian cold war. Both Saudi Arabia and Iran sit atop vast, young, underemployed populations. Both have undeveloped economies, though Saudi Arabia is far worse off in this regard. Both do not believe anyone will ride to rescue their regimes. This makes both quite insecure. Both have double-downed on political Islam as the ideological linchpin of their regimes. Saudi Arabia uses its Bedouin-based Sunni monarchy; Iran has its Shi’a ulema-dominated republic. But political Islam is a backwards political model: it empowers people who don’t have much need of proper statecraft. This weakens both the economy and the state of those who practice it. Since political Islam cannot deliver a better economy or better government services, it must instead convince people it is capable in other ways. That mostly boils down to security for both the religion and the nation. If a state run by political Islam can spread its version of Islam, it gets the credibility that goes along with all missionaries. If it can keep the nation safe from foreign threats, it gets a boost too. And the best way to secure the state is to push back threats through alliances, proxy wars, and influence peddling. Therefore, both Saudi Arabia and Iran have two conflicting goals: to spread their mutually incompatible version of Islam, and to strengthen their nation at the expense of others. Iran has been playing this game for decades, but has mostly been running up against a hard wall of American power. But now that wall has clear gaps, and Saudi Arabia is rushing to plug them. And this has led to Saudi-Iranian proxy conflicts in Syria, Lebanon, Iraq, Yemen, and Bahrain. Lebanon is the oldest struggle; because of its relative strategic unimportance, and because the nearby Israeli army could always sort threats on behalf of the U.S. if necessary, America has long been uninterested in Lebanese affairs. This has allowed Iran via Hezbollah and Syria and Saudi Arabia via the March 14 alliance to compete for influence there. But Lebanon is small potatoes, little more than a spy vs. spy proving ground, compared to nearby Syria. Syria has always needed outside help to keep its state in control of its many diverse sects and cultures. First it was the French; then, the Soviets. After 1991, it became Iran, but Iran could never give the same level of support as the USSR. It was only a matter of time before rebellion: the Arab Spring was the perfect excuse. Saudi Arabia rushed in with arms and cash. Iran countered with troops. The end result has been a stalemate that has given neither side an advantage. The U.S. invasion of Iraq in 2003 removed a reliably anti-Iran government: what replaced it was relatively democratic but also relatively pro-Iran. This opened up Saudi Arabia’s vast northern border to infiltration and even invasion by an Iranian proxy. To combat it, Saudi Arabia supplied Sunni Iraqis with cash to win elections and guns to stymie Baghdad’s control of Sunni regions. But neither of these are of the same strategic caliber as Yemen and Bahrain. Yemen was once reliably pro-Saudi; it has now fallen into a political morass, with Yemeni factions of varying stripes battling it out as the groundwater runs out. Yemen’s Shi’a Houthis are not precisely Iranian proxies, but they will certainly make common cause with Iran, and they do not like Saudi Arabia. Iran has reason to exploit a ripe situation; Saudi Arabia sees a wound that could go septic and has launched a major ground war to stem the geopolitical bleeding. But it is in Bahrain, and Saudi Arabia’s own Eastern Province, where the conflict is hottest. Bahrain: the tiny kingdom that could bring down the Saudis. Bahrain is a threat to Saudi Arabia, and a boon to Iran, in a way no other proxy battleground could be. Bahrain is, like Saudi Arabia, a Gulf Arab monarchy. Its economy is mostly based on oil. It has a great deal in common with other Gulf Arabs, many of whom have visited or worked there. Worse, it is a Sunni monarchy with a majority Shi’a underclass. Shi’a have virtually no power on the island, and it is all too apparent on a quick drive through any Bahraini Shi’a village. If a revolution were to occur on Bahrain, it would be Shi’a led and likely bring the kingdom under Iran’s influence, if not outright control. Such a revolution instills abject terror into every royal in the Gulf. To bring down the Bahraini king is to prove that Gulf Arabs are just as capable of revolution as any other group. It is a precedent none of the GCC states wants set. Worse, for Saudi Arabia, Bahrain has excellent naval facilities: the U.S. 5th Fleet is based there. It has a bridge linked to the Saudi mainland and could threaten Saudi oil facilities in the Eastern Province. To give Iran a foothold that close to Saudi Arabia is to complicate Saudi’s defense needs immeasurably, allowing a relatively small amount of Iranian troops to threaten almost the whole of Saudi Arabia’s eastern flank. From Bahrain, Iranian spies could infiltrate the Shi’a dominated Eastern Province with ease; they could foment unrest, strikes, and protests that could cripple Saudi’s critical oil industry. Such moves could readily bring down the monarchy. Hardly comforting for the House of Saud. This is why Saudi Arabia sent troops to Bahrain, and will send as many troops as necessary to keep Bahrain in its orbit. It is also why Saudi Arabia publicly executed a prominent Eastern Province Shi’a cleric who had called for protests against the regime: Saudi Arabia sees not a democratic protest with whom it merely disagrees but an Iranian agent that wants to bring Iranian power to the Arab side of the Persian Gulf. The domino theory is easy enough to see: the Bahraini king falls, a Shi’a Islamic Republic rises in his place, emboldened Saudi Shi’a rioters cripple the oil industry in the Eastern Province, Saudi Arabia fails to pay its bills and defaults, riots break out across the Kingdom and the security forces are unable or unwilling to stop them, and then someone realizes now would be a great time to kill the hated royals. It is not such a mad thought, and it is certainly worth deploying as much power as possible to prevent. Imagine the propaganda boon it would be to Iran were it to topple the Saudis. To knock out the Saudis is to remove the primary ideological threat to the Islamic Republic; it would breath life into the regime as few other things could, proving that political Islam could truly get things done. This is why Iran pushes into Bahrain, Yemen, Iraq, Syria, and Lebanon, though it has yet to make many gains. Iran’s clerics have just as much incentive to press the advantage as Saudi Arabia has to push back. Having been on the defensive for decades, Iran relishes the chance to finally take ground. Iran’s own strategic imperatives requires it to dominate or at least neutralize Iraq, where most invasions of Iran have emanated. That this also turns the Saudi flank is all the better. But while America is down, it is not out. A full-on Saudi-Iranian war is unlikely since the U.S. would be forced to take a side. Right now, that side would still be Saudi Arabia. That means Iran may have all the advantages right now, but it cannot cross certain red lines. It must hope it can inspire revolutions the U.S. will do nothing to stop. Over time, it is very likely the U.S. will realign more towards Iran. This will give Iran an advantage over Saudi Arabia for influence. The U.S. will not seek a situation whereby Iran dominates Saudi Arabia, but that may be beyond its power to stop. Saudi Arabia knows this. They will strike further and harder than they ever have before while they still have America’s backing. This cleric was useful cannon fodder: his death is meant to send a signal to the Shi’a who may be thinking of taking up his call. Human history says such a move will backfire, but Saudi Arabia is rich in bullets. Excellent and uber-helpful analysis, as always! Thanks for walking through the geopolitics of the region so thoroughly. It seems like a lot of the analysis over the past couple weeks (including this blog) has illuminated how fragile the Saudi monarchy position is currently. But I also wonder how secure the Iranian regime feels? It seems to have scored some geopolitical wins of late, including the nuclear deal, and the upper hand that the Assad regime seems to be gaining in Syria. But it wasn’t that long ago that there were mass protests in Iran, and there still seems to be tensions between the Rohani government and the religious clerics over the future of the country. Any ideas about what’s happening there, and how that power struggle may affect the broader Middle East geopolitical game? I think a huge reason the conservatives tolerate Rohani’s government is because of that insecurity. Rohani does a great job of building a bridge between the agitating youth and dissidents who are growing stronger while keeping the current governing structure intact. That the Islamic Republic has relatively wide-scale elections allows it to absorb much of that energy in a way that Saudi Arabia cannot. Iran has the potential to institutionally and peacefully drop the “Islamic” part of its name; Saudi doesn’t. While there are factions within Iran who would resist that, they may be content to establishing a “deep state” like Egypt or Turkey, leaving the day-to-day governance hands off while genuine democrats run the show. That seems to be the way the Iranians are going today. You should have a Patreon or something. I feel like giving something back to you for your fantastic content. I’ve got a couple of books on Amazon – reviews there always help! I’m also working on a GMS book due out in the summer; that also could use a share and a review! Thanks for the kind words!